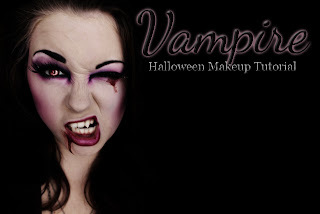 Wow great vampire look, best I've seen so far! Love this look. And it's all purple! Kassie, this look is so sick!! It's drop-dead GORGEOUS. I love the way you did the placement of the darker shadows in relation to the "lit up" center of the lid. So beautiful!!! You can honestly do no wrong. I love the middle portion of the eye, everything's fabulous. I adore it! Great tutorial! And the lookyou greated looks just amazing! woooow, this looks fantastic! I loove it! need to try a more wearable version of that, because halloween is over...but it is just great! And thank you so much for following! Wow your look is AMAZING!! I just found your blog and you have some awesome looks! gosh the blending was amazing!!! can't stop looking at this!